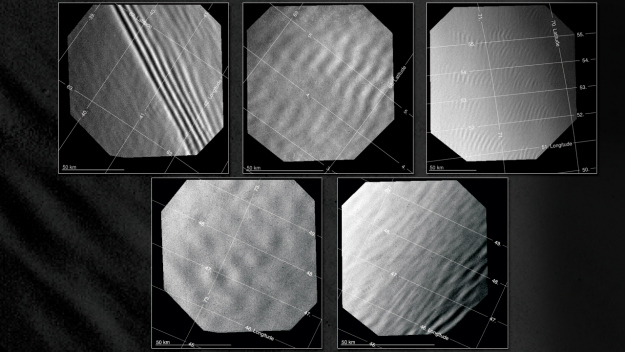 A study of gravity waves in the atmosphere of Venus has found four types of waves: long, medium, short and irregular. Identified in images obtained with the Venus Monitoring Camera they were mostly found at high latitudes (60-80 degrees N) in a region of high cloud known as 'the cold collar', and they were concentrated above the continent-sized highland of Ishtar Terra. Long waves (top left) appeared as narrow straight features extending more than a few hundreds of kilometres and with wavelengths (separation of crests) between 7 and 17 km. Medium type waves (top centre) exhibited irregular wave fronts extending for more than 100 km and with wavelengths of 8 - 21 km. Short waves (top right) had a width of several tens of kilometres and extended to a few hundreds of kilometres, with wavelengths of 3 - 16 km. Irregular wave fields (bottom row) appeared to be the result of wave interference. The octagonal shape of the images is due to the VMC field of view.